The legendary opera singer Maria Callas was at the height of her fame and beauty when her millionaire lover Aristotle Onassis decided to ditch her and marry Jackie Kennedy instead. Spurned and full of anger, she channelled her feelings into her one and only film role in Pier Paolo Pasolini’s Medea and blazed a trail of passion across the screen. Using the ancient Greek play by Euripides as his springboard, the Italian director fashioned a strange and sparse interpretation in which the concepts of ‘mythos’ and ‘logos’ are personified by the sorceress Medea and the action hero Jason. Medea represents the old world full of superstition and Jason is the new where logic reigns supreme. 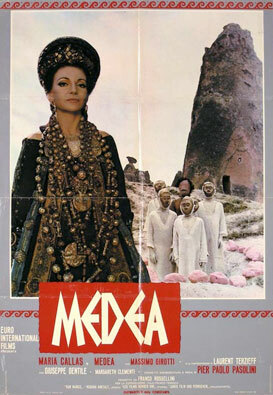 Medea resides in Colchis, an ancient desert centre set in the bizarre Turkish town of Capadoccia. Having presided over the ritualistic sacrifice and dismemberment of a young boy in order to ensure crops for the coming year, she goes to the temple and has a vision of Jason (Massimo Girotti) en route to steel the legendary Golden Fleece. She urges her brother to help her steal it and deliver it to the warrior. Then, to delay the army that sets out in pursuit, she hacks her brother to pieces and scatters his royal body behind. Ten years later we find Medea, shrouded in even more magnificent costumes courtesy of Piero Tosi, in Corinth. She has born Jason two sons but he has fallen for the princess Gauce and is about to marry her. To avoid any trouble the King banishes Medea and her sons and it is this gesture that spawns the act of infanticide that is forever linked to her name. Callas plays it out like the most loving of mothers and with her smouldering khol-rimmed eyes, avenges herself of the betrayal by Jason and in a subliminal way, Onassis too. Onassis was a huge idiot for leaving such a woman. End of the story.